Home / Chennai Super Kings / IPL / IPL 11 / IPL 2018 / IPL 2018 Match Preview / Match Prediction / Mumbai / Sunrisers Hyderabad / Wankhede Stadium / IPL 2018 Final CSK vs SRH Match Prediction, Preview and Head to Head: Who Will Win? 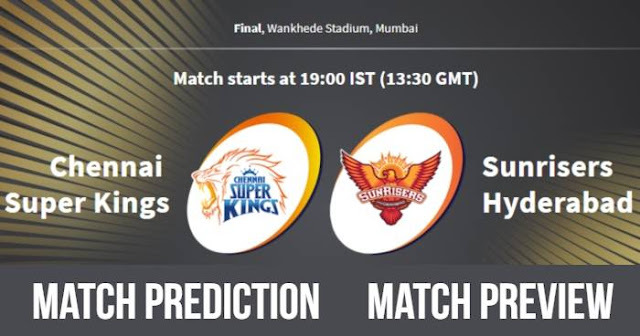 IPL 2018 Final CSK vs SRH Match Prediction, Preview and Head to Head: Who Will Win? Finally, after 59 matches and 49 days, Chennai Super Kings (CSK) and Sunrisers Hyderabad (SRH) will be playing final of the 11th season of Indian Premier League - IPL 2018 Final on 27 May 2018 at Wankhede Stadium, Mumbai. A clear evening with the temperature around 30ºC and humidity above 70% is forecasted. In last match here at Wankhede was played between Chennai Super Kings and Sunrisers Hyderabad, and the spinner was getting a lot of help from the pitch. With the likes of Rashid Khan and Ravindra Jadeja, a show can be seen. Chennai Super Kings are looking in great form and would like to tinker their playing XI. Sunrisers Hyderabad will have to make a tough call; in the last match, they made three changes. Bringing Wriddhiman Saha paid off while K Khaleel Ahmed and Deepak Hooda brought in place of Sandeep Sharma and Manish Pandey was unable to inspire. Chennai Super Kings and Sunrisers Hyderabad had played 9 matches against each other head to head in IPL, out of which Chennai Super Kings have won 7 of them and Sunrisers Hyderabad have only won 2 matches. Chennai Super Kings have won 4 matches of the last 5 played between them, including 3 matches in this season. Chennai Super Kings and Sunrisers Hyderabad have met once at Wankhede Stadium, Mumbai which was won by Chennai Super Kings. Chennai Super Kings have played 6 IPL Final and had won 2 Final in IPL 2010 & IPL 2011. Sunrisers Hyderabad have played 1 IPL Final and won in IPL 2016. In 8 matches played at Wankhede Stadium, Mumbai; 4-4 matches are won by the team batting first and team batting second. In 10 IPL Finals, the team batting first has won 7 times and team batting second have won 3 times only. In pressure like situation, the team would like to bat first. Wankhede’s pitch has behaved both ways in this season; the high scoring game has been seen with game dominated by bowlers. Score around 160 will be the par score. 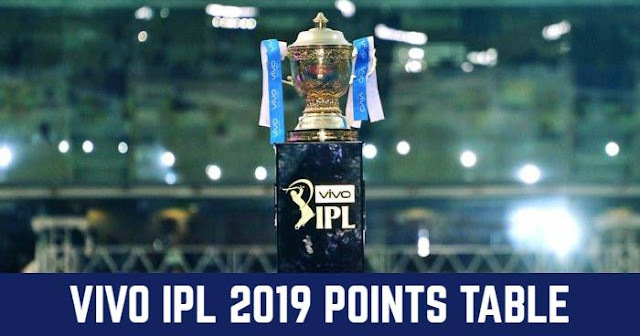 Chennai Super Kings and Sunrisers Hyderabad are the last two teams standing in the competition, and they will vie to be crowned the VIVO IPL 2018 champions by winning IPL 2018 Grand Finale. Sunrisers Hyderabad finished at top of the table which was followed by Chennai Super Kings. When they met in Qualifier 1, Chennai Super Kings won to be in IPL 2018 Finale, while Sunrisers Hyderabad played Qualifier 2 and defeated Kolkata Knight Riders to be in the finale. Chennai Super Kings dominated Sunrisers Hyderabad and won all the three matches won this season. Who is your favourite team in IPL 2018 Finale – Vote Now. In our prediction, Chennai Super Kings are going to lift the IPL 2018 Title. Toss: Chennai Super Kings won the toss and elected to bowl first. Playing XI for CSK: Shane Watson, Ambati Rayudu, Suresh Raina, MS Dhoni (c & wk), Faf du Plessis, Dwayne Bravo, Ravindra Jadeja, Karn Sharma, Shardul Thakur, Deepak Chahar, Lungi Ngidi. Playing XI for SRH: Shikhar Dhawan, Shreevats Goswami (wk), Kane Williamson (c), Deepak Hooda, Carlos Brathwaite, Shakib Al Hasan, Yusuf Pathan, Bhuvneshwar Kumar, Siddarth Kaul, Rashid Khan, Sandeep Sharma.